If you've previously learned to foundation paper piece from me, you might not even notice that pieces A5 and B5 are what I call a "tricky angle". This is an angle that if pieced in the way many sewists have learned - with a large piece of fabric to make sure you cover all your corners - it would take a much larger piece of fabric to fit the spot. I don't piece in this way. I custom fit every angle, every time which saves yardage and more importantly for me personally, saves frustration. However, if you haven't learned the Violet Craft way... you may have gotten to piece 5 and are cursing me under your breath and might be convinced the piece won't fit... now what? In the following photos I show you step by step how the triangle piece you've precut not only fits into the A5 or B5 space, but even has a little less than 1/4" extra around the sides. 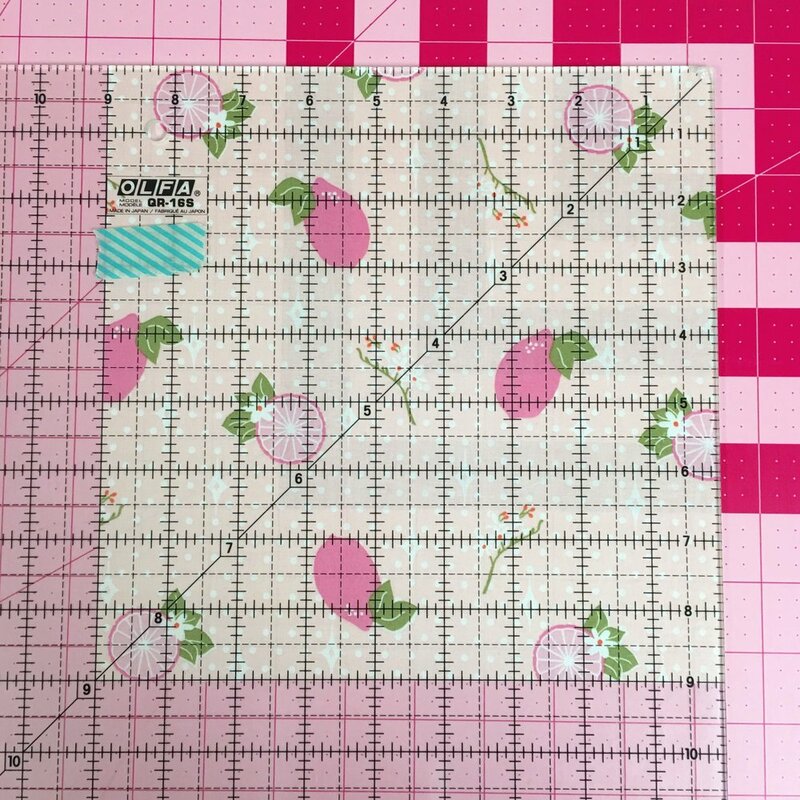 For this tutorial I am using the larger 22" template size which calls for a precut a 9" square. Cut the square in half diagonally. I have already pieced A1 through A4. Flip the template PRINTED SIDE UP. 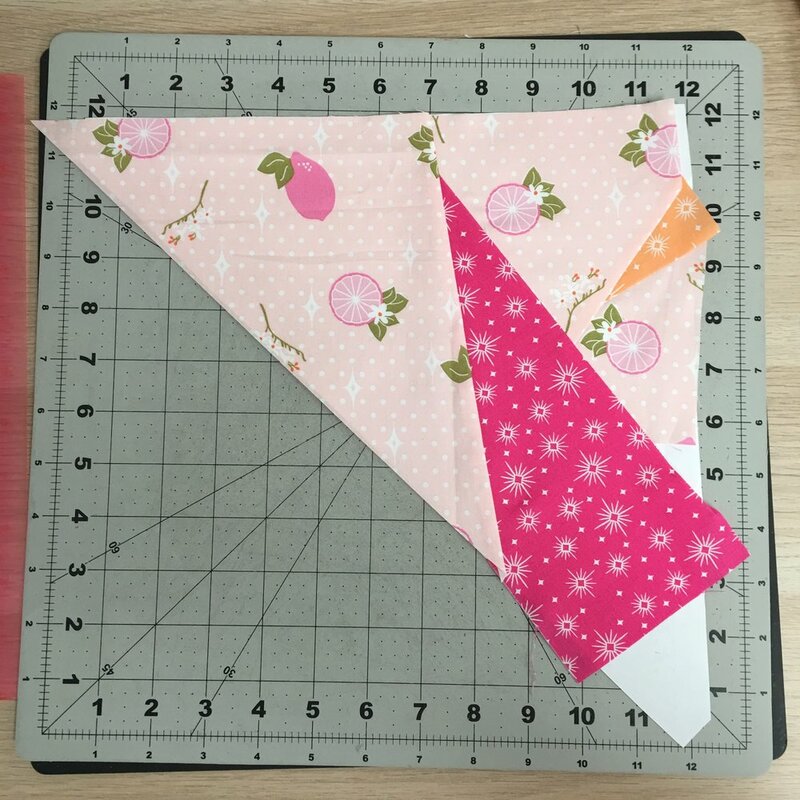 Fold back the template along the line you are about to sew that will attach the A5 piece and trim with an Add A Quarter ruler or a standard ruler with a 1/4" line. This is trimming the seam allowance of the previously added fabric so that you know exactly where the next piece of fabric will need to align. 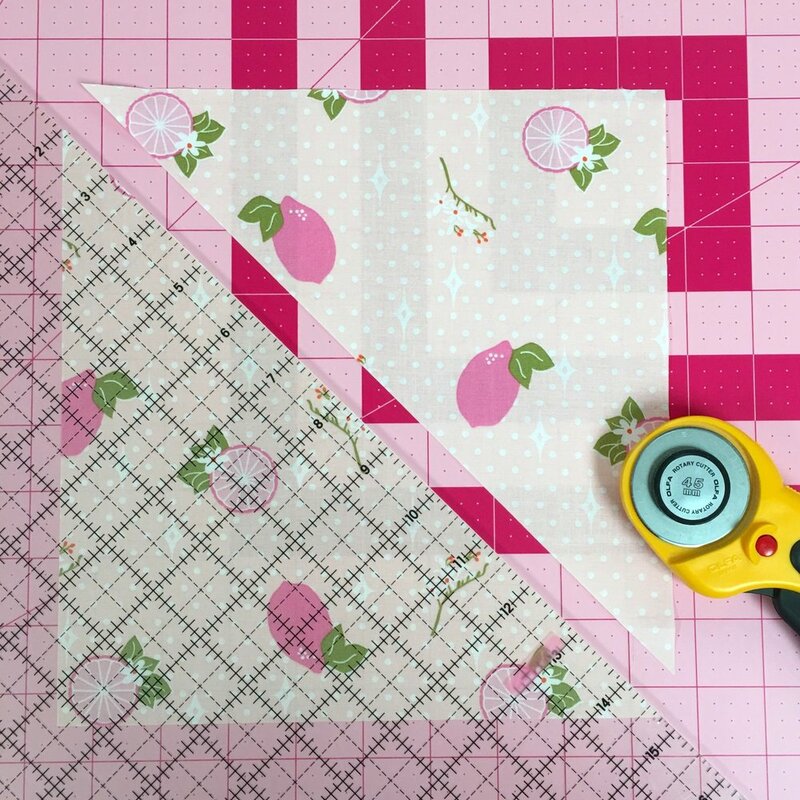 Place the A5 triangle of fabric cut in step 2 on your cutting mat RIGHT SIDE DOWN. Place the A5 template on top of the fabric TEMPLATE PRINTED SIDE UP. Notice that I have about 1/4" extra space around my template from the dotted seam allowance lines. You can see the fabric peeking out on all sides of the extra space. Do NOT MOVE the fabric or template. Holding them together in place, flip back the already pieced portion of your template so that the seam allowance you just trimmed pops out. Make sure nothing has moved, use a ruler to trim the A5 fabric to match the seam allowance you previously cut in step 5. Carefully slip the fabric out from under the template and place on top. Make sure the fabric is in the same place along the seam and has not moved up or down along the trimmed seam. Holding everything carefully in place, flip the entire template and fabric sandwich over. Place template side down on the mat. Fold back the fabric and roll the seam. Presto! Finish the piecing and trim to the dotted seam allowance.